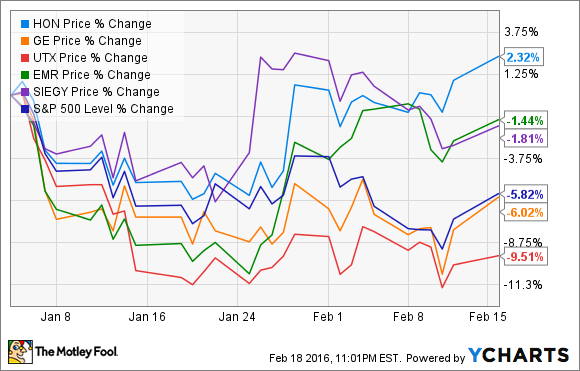 Honeywell is outperforming its peers by virtually every metric. How does it manage to do it? More importantly, can it keep it up? The company is also coming off of a six-year streak of double-digit earnings growth and dividend increases. And although the economic environment may be slowing down a bit, the company is predicting more growth going forward. Here's how the company manages to excel. 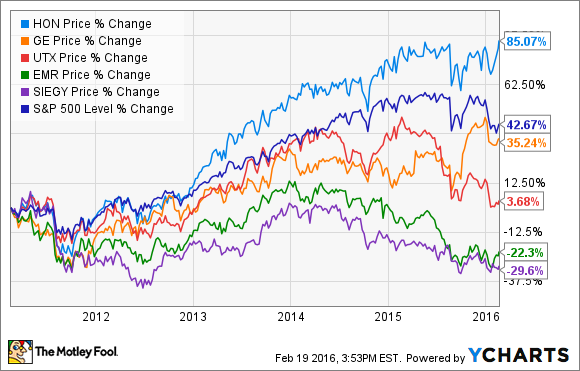 Like its peers, Honeywell is a well-diversified company. It operates in the aerospace, automation and controls, materials and chemicals, and transportation sectors. This diversity helps Honeywell to achieve outstanding performance: If one sector underperforms, other sectors can "pick up the slack." In recent quarters, this has helped Honeywell ride out the problems in the oil and gas sector caused by low prices. Honeywell's performance materials and technologies division services the oil and gas industry; as a result, that division's performance has suffered lately, with revenues down 10% YOY for 2015. However, the company's overall profits increased, led by the company's larger Aerospace division. Honeywell has also managed to avoid turning diversification into "diworsification" by not branching out into industries that are far from its core mission, like GE. GE diversified into many businesses, including entertainment -- by taking an 80% stake in NBC Universal -- and private-label credit cards. This proved disastrous for the company, and GE's CEO Jeff Immelt is now working to refocus the company on its core industrial businesses. Honeywell, to its credit, has been focusing on its core businesses all along. Another big advantage Honeywell has is its size. Because the company has many diverse businesses, it's large compared to many of its competitors. True, all the major industrial conglomerates are large companies; but they don't necessarily compete against one another. For example, while Honeywell has a large materials and chemicals business, rivals GE and United Technologies do not. United Technologies, on the other hand, owns Otis Elevator, an area in which GE and Honeywell don't compete. And even when the companies operate in the same sector -- both GE and Honeywell are active in the transportation sector, for example -- they aren't necessarily direct competitors. Honeywell's transportation offerings are mostly automotive parts, while GE's are locomotives. Credit also has to be given to the man in the corner office, Honeywell's Chairman and CEO Dave Cote. Cote has helmed the company for 14 years, and has made smart decisions that have positioned the company for future success. In 2013, Cote was named "CEO of the Year" by Chief Executive magazine. The publication pointed to Cote's success in increasing sales and EPS. Since then, sales and EPS have continued to increase, with the company reporting 2015 sales of $38.6 billion -- up 75% during Cote's tenure -- and EPS of $6.10 per share -- up an amazing 268%. Cote has been very clear about his plans to move the company forward. In 2013, he unveiled a comprehensive five-year plan. Highlights include improving margins, rolling out Honeywell's new HOS Gold operating system, and continuing to pursue strategic mergers and acquisitions. All of these are areas in which Honeywell has already demonstrated proficiency under Cote's leadership, which is good: He knows to focus on the company's strengths. For shareholders, one of the most-appealing features of the plan is to grow the company's dividend faster than earnings. Honeywell has one of the lowest dividend yields among its peers, trailing both GE and United Technologies; so Cote's commitment to growing it is good for investors. Honeywell shares many advantages with its industrial conglomerate peers, particularly size and diversity. However, it has managed to capitalize on these advantages in ways the others haven't. It has managed to successfully diversify without "diworsifying," and has managed to grow steadily. But perhaps Honeywell's biggest asset is David Cote and his management team, who have consistently set ambitious goals, and met or exceeded them. With Cote at the helm, and a five-year growth plan already being successfully executed, you should have no qualms about investing in this unique industry success story.